The Price Of Eco-Madness: California's Oil Production Collapse | Watts Up With That? From the “everything is leaving California these days” department. The collapse of the oil industry in California, once our second-most-important producing state, is a very sad thing to see. The U.S. shale oil revolution has completely passed the state by. 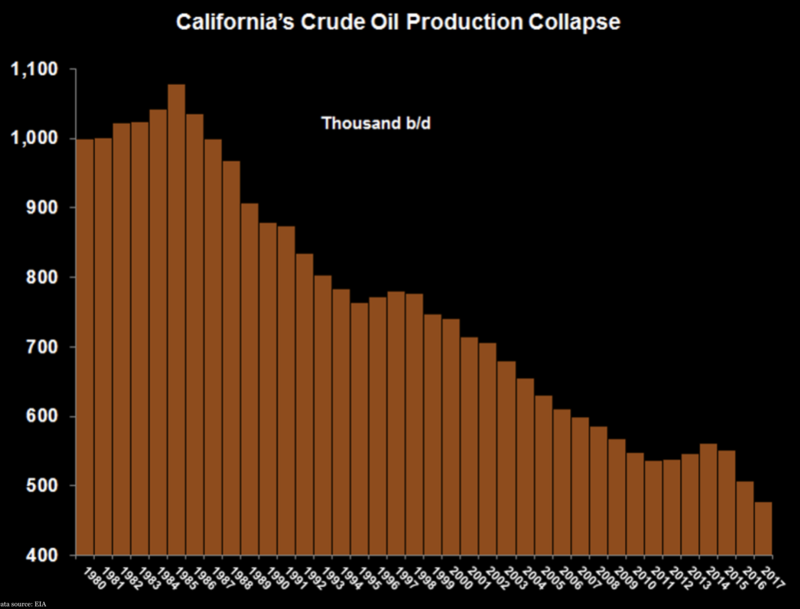 Although domestic crude oil production has reached heights not seen since the early-1970s, and will actually be setting new records this year, California’s oil output has plummeted nearly 60% since peaking in 1985 — with no sign of reversing. In stark contrast, mighty Texas has seen its crude production triple since 2010 alone to 3.6 million b/d. Every day, California consumes around 38 million gallons of gasoline…8 million gallons of diesel fuel…and accounts for 20% of all U.S. jet fuel consumption. Yet, California continually enacts policies to not produce any more oil itself. Unfortunately, imports from undemocratic oil nations have been forced to compensate: California’s Imported Oil Problem. Simply put, oil policies that hurt Canada and favor Saudi Arabia are more “greenwashing” than they are “green.” And poor energy policies also help to explain Why are California’s Gasoline Prices Always Higher? For shale oil, California could seek the Monterey formation, but that seems highly unlikely. The Monterey “contains vast reserves of oil” and should be key to California economic future. Offshore development? No chance. February 23, 2018 in Energy. Yes, this is the same Soros, who with the help of NGOs worldwide “fights” for a fossil fuel-free world. What a liar and a cheater. In Hungary and other Eastern European countries, he and his fellow organizations are declared persona non grata. But it’s very likely that he wants to increase his billions instead of throwing them out the window. At Soros, even the philanthropic branch of his brain is always focused on maximizing profits. A pure capitalist, but it is easy to seduce young, allegedly liberal and green. Funny, but in the history of the world have happened x times. What is it about George Soros? Here’s an article that debunks the news that he is officially persona non grata in Austria. Here’s an article stating that he single handedly wrecked the economy of Russia. Here’s a more balanced view. WRT to Soros, I am reminded of something from Fiddler on the Roof. The guy seems to enjoy making trouble as much as (or even more than) making money. George Soros is nothing more than a very rich amoral crook that should be in jail. The bad news he is “raising” people that will continue to do damage long after he is gone. The TV interview where Soros says he helped the Nazis confiscate Jewish property in WWII and didn’t feel any guilt about it tells you all you need to know about the man. George Soros is the bagman for the House of Rothschild and their proxy votes in the UN… as usual, follow the money. The segment where Soros talks about confiscating Jewish property begins around 6:45. This is exactly how politically connected rich hose bags keep getting richer at everyone else’s expense; push a bunch of “klimate” BS to drive down the prices of ACTUALLY USEFUL energy companies down, and then buy them up so they’ll be sitting flush when the sheep finally realize that we still DO need “fossil fuels,” and that “renewable” nonsense is not going to “change” anything. Kind of the reverse of the “pump and dump” that is done on worthless stocks – like renewable energy companies. And scum like Soros are rich enough to play both sides of the scam. This article omits the fact the Brown family, as in Gov Brown, has large holdings in Indonesian Oil. According an old article in the Sacramento Bee, California buys significant amounts of oil from Indonesia.. enriching the Brown family. Notice the linked article on ‘CA high gasoline prices’ ignores the massive CA tax on gasoline. US oil companies make about five cents off a single gallon of gasoline. US Big Government taxes on a single gallon are around seventy-one cents per state & rising rapidly. In CA the tax is now $1.00 per gallon, BEFORE Federal taxes. It’s Big CA Government, not Big Oil. A dollar in CA in state fuel tax alone? More like 41 cents, after the most recent increase just last year, a twelve cent per gallon hike on gas, from about 29 cents to 41 cents or so. Federal excise tax on gas has not changed in 25 years, and remains at 18 cents per gallon. Why are you just tossing out random numbers that have no basis in reality? Exaggerating is one thing, but when you mention specific numbers while purporting to be informing us, everything you say will be ignored, even if you might have something important to add. Your post implies federal taxes are 71 cents and California adds another dollar. This overstates the federal and state excise taxes there by something like 150% above what is true. The truth is bad enough. Making stuff up is what we try to counteract here. Menicholas, that’s an interesting chart regarding federal and state taxes. However, using the “Gas Buddy” website, I find that the lowest price for regular gasoline in Los Angeles is $2.99/gallon. In Philadelphia, which according to your chart has the highest state taxes on gasoline, the price is $2.73/gallon. So why the discrepancy? To start with your chart from January 2017 is correct on the Federal tax but a little out of date as the state tax on gasoline is now 50 cents as of November 2017 not the 38 cents as claimed. That is scheduled to go up again in July 2019 to 57.5 cents which will make California gasoline the second highest taxed in the nation. Thanks to local taxes and fees the present day tax cost is nearly 60 cents a gallon. The State excise tax then adds another 30 cents on top of that so Wally’s $1.00 in state taxes isn’t actually that far off. On top of this, gasoline, before its even taxed, costs more in California because of the unique gasoline formulations the state requires which also change twice a year. Remember you already have the second highest average gasoline prices in the US at $3.31/gallon second only to Hawaii at $3.41. Given the taxing nature of the folks in Sacramento I’m sure that California will find a way to become number one in the future. Pity the poor folks in South Carolina where the average price is now $2.24/gallon. Sometimes it’s best to be last. Let’s say Soros took Obama for his word that coal and oil were dead. Short the stock of those companies. Unload your shorts (so to speak). Soros invests. What doesn’t matter. Or, let’s say that Soros TOLD Obama to say that… and leave the rest the same. I find the suggestion that Obama ever had an original idea to be beyond hilarious. Puppets don’t think. The oil production curve looks like the one from Venezuela. Leftists are great at destroying economies. It looks like the Five-Year Party Plan is on target. The Party of Gentrification says you leave and we have less congestion to deal with. Common sense does not reign supreme in California. It moved to TX decades ago! Will California be a have not state soon? Ontario Canada is now a have not province with quadrupled electricity prices since 1966 in inflation adjusted dollars (with most of those increases starting in 1990) because of the Greens. When it comes to California, you cannot fix stupid. The best thing the rest of the nation can do is give incentives to California companies to leave the state…especially high-tech companies. Indeed, they are now a come & get everything free ‘sanctuary state’ which will greatly hasten their economic demise. As to California ever getting out of the current political mess, it seems like it will happen about the eleventh of never. You keep trying to post this garbage about your personal crusade, and they keep getting deleted. There’s a reason for that. You have continually violated our site policy. No more. What did he try to post? I find myself very curious about that as well. Where would any oil company stand legally if they announced that they would not supply California with oil or gas because the State claimed that their actions were damaging the Californian environment and human health because of emissions produced when their products were burned? From the oil companies’ perspective if they could avoid being sued such a salutary demonstration would quickly install a much needed sense of reality. I realise of course the chances of any such thing happening are vanishingly small – and I have nothing against Californians who deserve no such horror. An alternative is to charge extra. Call it the California excise fee. Why not profit from the foolishness until the politicians wake up? Puts the pain on the problem point and not yourself. Relatively innocent consumers will suffer, of course, but they vote the numbskulls into office and so must share some blame. Agreed with the sentiment; however sad it makes me to say it, though, I doubt the vast swarms who vote for any idiot bearing the democrat label (and not just in CA, for that matter) will ever “get” it and start voting for ANYONE else. Same problem in my own state – and I DON’T vote for those idiots, but there’s too many who do. In Canada we have a trade war between BC and Alberta because BC refuses to run a new pipeline from Alberta through to the Pacific Ocean on BC land. ScotiaBank estimates that pipeline delays and cancellations are costing the Canadian economy $15 billion a year. Actually it will be only $10 billion because of new oil shipment railway capacity. The ironic thing is that it is far safer and cheaper to ship oil by pipeline than tanker railway cars . Just ask the people of Megantic Quebec when half the town exploded because of a runaway railcar oil train. I should mention that the premier of BC is a greenie. Funny how BC and California are both on the west coast. Adding to this irony is the fact that all three rail lines to the west coast go right along major salmon rivers (two on either side of the Fraser and one along the Skeena) including long stretches of canyon terrain where they literally are right beside and above them, and where derailments are relatively frequent. Recipe for eventual disaster. But reality and logic is irrelevant to the greenies. Cue the video of those eco terrorists DRIVING to a pipeline valve station to turn it off, in order to save the world. There is no trace of logical consistency in anything related to the modern eco-loons’ agenda. I also have nothing against Californians. I have been to California a few times myself. But then it was not as crowded by Hispanics as it is today. The Democratic Party in California plays the race card and plays new immigrants against long-time residents. This goes well until even the new immigrants realize that they are only exploited politically and are needed only on election day. # And this will not take long. Tension between black and hispanic groups has been increasing as both groups are demanding to be the primary beneficiary of race conscious government programs. +1 Many immigrants are here because they left countries that were corrupted by politicians and recognize the signs. But without the citizens, who will pay the bills? Most oil is sold through independent franchisers. A sudden cessation of oil shipments would violate the contracts the oil companies have with these franchisers. If the oil companies did start to restrict sales to a state, the first oil company that offered to start supplying these now cut free franchisers would instantly gain a huge increase in market share in that state. The only way to prevent this from happening would be for all of the producers to get together and agree not to undercut each other. However that would be collusion, which is illegal under a different set of laws. The only way they could do this would be if they offered it as a court moratorium. “You say that our product harms the environment. Therefore, if you want, we will stop selling our product within your state”. If the court agreed, it would be considered force majeure and not violate contracts. If the state turned down the offer, it would be nice ammunition against their argument. After all, if something is so necessary that not providing it would be disasterous, then how can someone be sued for providing it? The headline article states the percentages of fuel consumed by CA as a fraction of total US usage. What do you thing would happen to the stock of a company which suddenly reported revenues dropping by those percentages? And what of the people who work for those energy companies in CA and the places that maintain supply lines to CA? People have mortgages, mouths to feed, bills to pay. Anyplace not pumping oil or mining important resources that everyone knows are sitting someplace (New York bans fracking despite enormous resources in the ground) or another, are more or less just keeping it in the bank for later. It will be there when we need it. At some point in the future, jackassery like this will be unthinkable. Some people never fill the gas tank in their car, but when a hurricane is coming, trust me…them tanks get filled. Moderately Cross. Do you know of any state that went hard left and then came back to good governance, free enterprise, and prosperity? I wonder what the percentage is of those that go hard left and eventually recover? And over what time frame? A really interesting question. It seems to me that if a state — Or a city — goes hard left, it is the beginning of a long, one way trip to nowhere and nothing. But then it also seems to me that the left-leaning state and local politicians who put their states on the path to ruin always seem to have enough influence in that strange little foreign country that’s called The District of Columbia that they are able to get federal bailouts at the expense of those states and locales who haven’t gone on the trip to oblivion. Wisconsin pulled itself back from the brink of socialist democrat submergence with the election of Republican Gov. Scott Walker in 2010. After surviving a recall election in 2012, he was re-elected in 2014. In a stunning upset, Wisconsin then voted in favor of President Trump in the 2016 election, helping kick corrupt Hillary Clinton to the curb and giving America a leader that respects traditional values. Only time will tell if it was just a temporary reprieve from the slide into socialism submission or a watershed moment in Wisconsin/American political and economic history. Texas once was decidedly blue with Cecil Richards’ (president of Planned Parenthood) mother being the last Democratic governor over a 121 year period interrupted only by Bill Clements. Then Texas had a Lefty ‘Republican’ in George ‘W’, until Rick Perry’s 14 years and now Abbott. So TX did go from hard-core Progressive to arguably strong conservative – this by absorbing millions of people from the Rust belt and the north east. Demographics do make a difference. Well we all know why communism doesnt work because no one wants to work and no one knows how to overturn the demand supply equation which governs all economic life. . But few realize that socialism cant work either. As i have posted before if no one has more money than anyone else then everybody is essentially poor like they are in Cuba. Then because socialism would still be democratic it would have election campaigns but everybody would be too poor to be able to contribute to these election campaigns. Socialism has always quickly devolved to a communist society. There never has been a truly socialist country. It is impossible. But the greenies keep hoping. 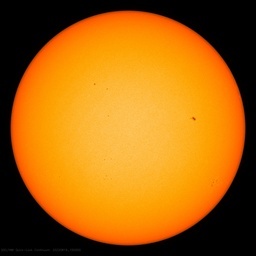 Even their latest try with the AGW scam is doomed to failure. The political pendulum is in constant motion. The only thing it never does is stop and stay in the middle…or anywhere in particular, not forever. Not in the US. Not so far. The time horizon for these changes may be longer than most people are able to discern without a look at the voting history reports. I wish I had a nickel for every time a liberal friend told me about how the conservatives would never win the White House again, due to the blue wall, demographic changes, etc. When I pointed out the long history of our country, in which one side has rarely dominated for more than a few terms of office, somehow people always think that “now” is different from anything which came before. It is not. Not regarding psychology. Trends and tendencies that are established over hundreds of years are the way they are for reasons transcending the issues of the day. There have been decades long trends in the party with the majority in congress. When the R’s won a majority in the House in 1994, it was a seismic shift. The D’s had had a solid majority in the House since 1954! And for a lot of that time, they has veto proof majorities in the Senate as well. So, yes…the pendulum does swing the other way. Obviously so, with a moment of thought: If things always trended towards ever more liberal, we would long ago have become monolithic. CA leglislatores are idiots. They shut down the agriculture in one valleys to save the Snail Darter! Millions were devastated, Sacramento didn’t care, still doesn’t! Right on Bill! I remember driving through Bishop, California and seeing the bumper sticker that said “It takes a thousand pupfish to make a sandwich!” which was due to declaring the desert pupfish an endangered species out in Death Valley. Death Valley? Clue number one is don’t live in any place called Death Valley. Yah it still holds the record high world temperature that was ever recorded. No, the snail darter was in Tennessee and it blocked completion of the Tellico dam on the Little Tennessee River. I know because I grew up about 20 miles from this dam. Wrong little fishie. It was the Delta smelt, not the snail darter. The Monterey Shale is not likely to be well suited to the types of long lateral completions that made the Eagle Ford and Bakken so successful and rejuvenated the Permian Basin. Actually, Occidental spun-off all of its California assets to California Resources Corporation, in order to divest itself from California, and concentrate more on the Permian Basin in Texas and New Mexico. As far as I know CRC has not done very well since the spin-off, but there may be hope as oil prices recover. A significant part of the decline in production is likely a function of the resevoirs. It is my understanding that the water cut in a significant number of the wells approaches 90-95% which is typically near the end of the wells life span. Though, depending on the field, wells with at 95% water cut have been known to last 30 years at the level. Just commenting that there are other likely causes other than CA’s green nut cases that are the root cause of the decline. I thought CA has untapped oil resources just offshore…..
That may be true, but Cali instituted a complet ban on new offshore drilling after an incident some years ago. And to think, they have asphalt volcanoes in the Santa Barbara channel. The lifetime behavior of oil wells is the same in California as anywhere else. That does nothing to account for the difference in overall change in California production vs production in other states. It is the green nuts’ fault that the location and production of new wells has been slowed down so much in California, compared to other oil-rich states. This does seem a fitting metaphor for the entire environmental movement. They want everyone to sacrifice but themselves. They’re willing to consume in great quantities but not willing to produce. No doubt the peak oil crowd will claim this drop in CA production as proof that they were right all along. I read this morning that there has been a series of earthquakes in the San Fran area. Dang, frakking is so dangerous that just thinking about it is enough to cause earthquakes. The Monterey shale is indeed an abundent oil source rock. Estimated to contain >15Bbbl and maybe as much as 27. Sourced the now mostly depleted Kern River oil fields near Bakersville. But the present technically recoverable reserve (TRR, using any known technology at any price) is essentially zero. The Monterey is very young (15mya) and the only way it got buried deep enough to reach the oil catagenesis window is through aggressive geological tectonics. Meaning it is severely folded and faulted. Meaning there is nothing to horizontally drill. Details in essay Reserve Reservations in ebook Blowing Smoke. The shale revolution skipped California not because of their idiot antifracking stance, but rather because there is no possibility of drilling long horizontal wells worth fracking. There is enough production to power bullet trains all the way from Fresno to Bakersfield. The will be lucky to get that train to go from Madera to Fresno(15 miles for you non-California types). How about sloped or curved drilling? The tectonic folding is severe. Slant drilling would work, but the slant runs would be far to short to be economically feasible. I have actual geological illustrations where the Monterey outcrops near Laguna Beach. In the Bakken and Permian, the ‘horizontals’ (really sloped to follow the bedding) are over a mile and up to two miles long. In the Monterey you would be lucky to get a few hundred feet. Even in flatter areas on San Joaquin basin, where long laterals could be viable, success has been limited- see my comments above. And to re- iterate what Rivistan stayed, the complicated structure elsewhere makes it untenable. Note that all successful shale plays have been in tectonically quiet / flat areas. Many complicated areas have been explored for shale resources without success. Oil tends to accumulate at the top of folds. Not in shale plays. Structure only matters in shale plays when there’s too much of it. I am gonna take a WAG that eventually, with lot’s of practice everywhere that is being fracked, some news ways to recover resources will be on the table that were not feasible previously. Look how suddenly fracking became a thing. I doubt people are going to stop learning how to keep making improvements. There have been many slanted, and horizontal wells drilled in the San Joaquin Valley. Yes, the formations on the west side of the valley are highly faulted and folded, but the well are drilled either slanted, along the bedding plane, or horizontally along the fold axis. Oil has been produced in California from biogenic shales, like the Monterey, for many decades, and hydraulic fracturing has been done routinely in both vertical and horizontal wells. I have been away from California for four years, so am not up to date with recent developments, but I think the recent regulatory issues have been more with respect to produced water disposal than with fracking. Would fracking work in the Bakersfield area? It’s all flat, but maybe the oil is below the flat parts. As an outside observer I am watching California’s race to the economic bottom with interest. The bottom is a relative thing. They are still one of the largest economies in the world. “Look how suddenly fracking became a thing.” Well, not really. Fracking aka hydraulic fracture stimulation was invented by an American company in 1949. (I worked for that company for 24 years.) Decades of progress, incremental technological innovation and knowledge by private investors (risk capital) allowed the present state of the art to occur. The technologies (applied science) are many ranging from drill bits and mud systems to horizontal drill technology, fracking pumps, fracking fluids, fracking proppants, real-time monitoring and controls, rock mechanics, well-bore surveys, gyroscopes, accelerometers, critical geoscience and engineering knowledge, and many more. At in situ conditions, shales are relatively rubbery and difficult to frack, for one thing. Try to crack a rubber tire with a sledge hammer. It’s hard to imagine how anyone will benefit from this madness except some very short sighted politicians whose egos have overwhelmed their good sense. Resources not extracted now, will be extracted later. A rainy day fund, of sorts. True in the sense that at sudficiently high oil prices, the Monterey can be tapped by close spaced vertican wells and then fracked. But VERY expensive at the average Monterey shale catagenisis depth of over 8000 feet. I seem to recall in years past being assured that below $80, tight oil and Canadian bitumen sand is not worth producing. I can recall in 2008 when housing prices started to fall, home builders on TV wailing about how the prices were now “below the cost of the sticks and bricks”, and yet far further did they yet have to fall, and at the new prices, homes were still built and sold at a profit. See…the sticks and bricks got cheaper, and/or different sticks and bricks were used. How much of the “cost” to produce oil or whatever includes some fat salaries of people who are not getting their hands dirty, profits, etc…? Do not get me wrong, people deserve to be paid for their efforts and I love fat profits. But the fact is low overhead competition can step in and lower costs just about anywhere large profits are being made. There seems to be a discrepancy between the chart at the top of this page and the chart in the Forbes article (“California’s imported oil problem”) that you gave a link to. The article shows have as much oil produced in California as the chart above. I think it’s the pleasant weather in California that rots the brains of politicians and those who vote for them. Jerry ‘moonbeam’ Brown, Nancy ‘foot-in-mouth’ Pelosi, need I say more? Cal went past the point of no return when it enacted changes to election laws whereby they still have party primaries, but only the two highest vote winners make it to the general election ballot. That means two Democrats are now frequently running against each other on the general ballot. The local Republicans don’t have the union cash support nor the ability to break into this now corrupt system that favors the incumbents and the majority party. Plus the real kicker now is that Cal has made it legal for non-citizen aliens (legal and illegal) to vote in state and local elections. That further cements Democrat (actually they’re socialists and neo-Marxists) control. California hasn’t made it legal for illegal aliens to vote, it just made it a lot easier for them to vote illegally and not be caught. Some jurisdictions allow legal aliens to vote in local elections, but again, it’s hard to catch them illegally voting in state wide and national elections. Resident aliens, legal or otherwise, should have no voting privileges nor should they be eligible for public assistance except for the purpose of funding their deportation. This would be consistent with policies in most of the rest of the world, although many will force you to pay for your own deportation. I researched this when Trump set up the voter fraud commission. What Cali did was diabolical. They passed a law giving illegals drivers licenses (unlike Florida, no proof of legal residencynis required). They passed another ‘motor voter’ law enabling voter registration at DMV (driver license) locations by simplynfilling out a form. They have no means to check the voter registration form against legal residency. Sort of a sanctuary city idea writ large. There is literally no way in California using only California records to check for illegal voting. The closest would be to compare US passport and California birth certificates to registrations. But those systems are not linked. First the leftists set up the laws so that it is impossible to detect illegal voting. Then they point to the fact that nobody has been able to prove large scale illegal voting as proof that it isn’t happening, so we don’t need laws to make it harder to vote illegally. Most of the illegal aliens don’t have American values, they have South American values, being from socialist countries south of the border, so they are a perfect fit for the socialist agenda of the Democrats. That’s why the Democrats works so hard to keep them coming into the U.S.A.
How long until California switches from being an American state to being a South American state? The Democrats want to destroy American culture and bringing in millions of illegal aliens is one of their ways of trying to accomplish that goal. Things could get a lot worse in California besides higher gas and electricity prices. If Trump may direct ICE to cease enforcement operations there due to Cal’s Sanctuary Law, a state law which makes local police cooperation with Federal immigration law enforcement illegal. Yes Illegal. If that does happen, Cal will become an MS-13 sanctuary. The Mexican drug gangs and sicarios would multiply quickly. Local cops would be either put on the drug gangs payroll (as many are in Mexico) or they would be murdered at their homes (as many are in Mexico). Oil exploration and production would be the least of Cal’s worries. And then there are those miles and miles of tent residents I’ve been seeing on the news. Gotta be trouble ahead. We have a prime minister in Canada now who refused to use Canadian fighter jets to bomb ISIS. He is exploring a free trade pact with China whose stated goal is forced absorption of Taiwan and then a surreptitious subversion of the rest of the World to Chinese Communist party ideology and who to this day carry out forced organ operations on unwilling Falun Gong political prisoners. Sheesh we already import enuf cheaply made products from that totalitarian state. and China will never wreck thier economy by cutting back on CO2 emmissions. We truly live in a World of Oz. Trump is wrong. He should direct ICE to focus on landscapers, nannies, and housekeepers in Beverly Hills and Silicon Valley. Hit them where they hurt. Invest in ID, UT, NV, and AZ where the growth is going. The problem often is that California residents move to these states to escape the leftist madness. Then what do they do? They organize and work hard through demonstrations, lawsuits, and voting for leftists to turn their new homes into little Californias? Californians are mad. Why leave madness and then recreate in in your new home?? It would seem an electric vehicle would not be viable in traffic jams when air-conditioning is a requirement. Losing charge. Up here in Prince George our city officials wanted an electric car to play with so got the taxpayer to pay for it, Nisson Leaf. Now the officials admit this car looses half its range in winter but artfully avoid mentioning when it gets down to 30 below or more it is next to useless. they like using averages when mentioning range. Heater, lights, wipers and moving through snow covered roads like I said make this vehicle next to useless. I am sure they are scamming on how to get a taxpayer funded Tesla. Already partially funded with discounts. Starting the Y-axis at 400 makes a 50% decline look more like an 90% decline. A significant portion of California’s oil production is from heavy oil fields requiring steam injection, generally, not unlike the Canadian Oil Sands production not suitable for surface mining. More than a decade ago, when I was employed by Husky Energy in Calgary and had several heavy oil experimental projects on the go and was Husky’s corporate GHG compliance guy, I had occasion to read several reports (scholarly articles) stating that California’s per unit GHG emissions were in the same ballpark as those from the Canadian Oil Sands, surface mining and in-situ. Who cares about how much carbon is emitted we need more CO2 in the atmosphere not less. California piggies on the consumption side…. As long as there are states that produce enough oil, California can continue on ignoring its own resources. Any costs are just passed on to the consumers, so yes its expensive to live there but the government doesn’t really care. The higher their welfare costs (which are affected by fuel costs), the more they just tax everyone – what could go wrong with that? There are still plenty of high-tech industries in California to prop up (in tax revenue) its bad government for a while yet. The real elephant in the room is fresh water. They do not have a lot of options for fresh water other than producing it from ocean water, and that requires a lot of power. At some point California runs smack into a Fresh Water deficit that has no easy answers. Their agriculture output will collapse once surface water is not available (needed for cities), and aquifers go dry or produce saline. Or the next tech bubble. There are huge rivers north of the dry parts of California, both the northern part of the state and Oregon and Washington. If not for the climate change bogeyman distracting the conversation away from the fact that there are dry years and wet years in So.Cal., then the easy solution would be right now on the table. Negotiations, dams and pipelines, etc. Apparently it has not ever gotten bad enough for people there to snap out of their stupor and start using some common sense. Typical of liberal mentality, they want all the benefits of society without the responsibility required to have those benefits. As with manufacturing and resource recovery, there are major benefits from these activities but there are costs as well. But the liberal mindset doesn’t want the compromise necessary to have the benefits. The same goes for renewable energy. But right now the greens are willing to have the detriments of green energy, wind farms that are noisy and eyesores or renewable crops that hurt the land and waterways, for the thought that they are saving the environment. This will change too. I can see a day when the greens feed on each other over these issues. That will be an interesting time. Popcorn sales will increase markedly. It may be more like, people start dying and the people responsible start getting lynched. They could get lucky and muddle through with nothing like that. In my experience, things do not get interesting, they get disgusting, when painful changes come. How about the oil companies and POTUS Trump order say a one month stand down on gas refining, natural gas importation and ICE operations in Cali? That might get their attention. I am glad I do not live in a place where the President can “order’ a “stand-down” on people’s jobs and livelihoods nor corporations collude to interfere with the economy, or attempt to get what they want by economic blackmail. So you’re okay with California not enforcing the law? I live in a place where my state govt choose’s to pick and choose which laws they will enforce. The fact is people are dying because of these actions. And private companies have the right to increase or decrease production. California has boxed itself in with psuedo science gas blends. Only a handful of refineries are capable of producing “legal” gas blends. Some “un-scheduled” maintenance on two refineries could send gas prices through the roof. The central planners shouldn’t have left themselves so vulnerable. Turn about’s fair play. Imports into California are kind of irrelevant. For the last six months the total net imports into the US has been less than our imports from Canada. The reason I bring this up is that we typically consider imports of oil bad because they come from places like Saudi Arabia and Venezuela. If we stopped importing oil from any country not named Canada we would have the exact same amount of oil in the country. The only difference is that we would stop making money by importing foreign oil refining it and then exporting it at a profit. The fracking revolution has no more passed by California than it has passed by Nevada. Both states import their fuel from exotic locations like “Texas” and “Alberta.” Both states have fuel prices that are substantially lower than they would be in the absence of fracking. Both states are members of a nation that has full energy security (if we assume that Canada will not impose an oil embargo). Would I like to see sensible energy policies in California? Yes. However, it is the duty of the citizens of California to elect sensible politicians that will enact such policy. I do not think the rest of the country should touch California’s energy policy any more than they should touch Texas’ policy. As an aside, maybe we should allow tankers to dock in Houston, load oil, and then ship it to Long Beach. The legislation behind that particular piece of idiocy is national. Not sure the Panama Canal handles supertankers, but quite sure that pipeline is far cheaper. Been waiting for California to pass a law making fossil fuels illegal. Why should California be satisfied with just a moderate amount of hypocrisy. So, the legislators are going to drive to work one fine day and make the means by which everyone in the state gets around, and gets to and out of the state, illegal? Even the places that are making such laws (EU countries) are not doing it in a time frame which will take effect while those voting on the law are still around. Yes, they are jackasses, but even jackasses have limitations. If they ever made such a law, they would walk out to their cars afterwards, stop, look around at each other, and go back inside and vote to reverse their earlier vote. Staggering the number of people in positions of power and influence want the rest of us to use energy less and pay more for it who’s family wealth was derived from the very stuff they want us to stop using. Hypocrites the lot of them! Trump has opened the door to offshore California drilling. Californians who vote for this reckless government must be benefiting somehow. Er that is reckless California gov. I thought it would be about Jerry Brown. Although apparently it was as much George Deukmejian, Gray Davis, and Arnold Schwarzenegger as Good Ole Jerry. In fact, Jerry oversaw California at its absolute height of oil production. A couple of years ago, a California refinery had an unscheduled shutdown when inventories of gasoline were low. Importing (from neighboring states) refined product wasn’t allowed, as California has its own product specifications (for its clean air rules) that no other jurisdiction processes and thus created a manufactured crisis. The resulting chaos was fun to watch. Not so entertaining if you were a California resident having to commute via freeway. The NY Times always puts liquid “gas” (for gasoline) in quotation marks. I am not a geologist just a modest once mechanical engineer. I am not looking forward to the beaches along the Santa Barbara Channel once again befouled by heavy oil seepage that declined significantly with the onset of offshore extraction. That is an interesting and apparently often forgotten point that extraction can stop reservoir surface seepage. The Louisiana spill came from a deep area known from surface observation to be leaking a century ago. It has a specialized oil dependent benthic fauna. As of 1994, there were an estimated 5,000 natural oil seeps in the Gulf of Mexico or was it 50,000? I think it was 5,000 leaking 50,000 barrels per day. Texas A&M University research. Note that just because a car is electric doesn’t mean it runs oil-free. That electricity comes from somewhere, most likely from oil. In California more likely coal powered. The chart looks about like Venezuelan oil production, another outcome by policy dysfunction. If it weren’t for high-technology paying CA’s bills, CA *would* look like Venezuela in more ways than one. Don’t forget that the electric cars run on energy as well. Even in California this energy is likely to be oil or coal based. Where does California get its imported natural gas? Just curious. Better results sometimes to enter such questions in a search engine. It would be so fun to see their attitude if all imports domestic and international where cut off for a week. If states like California and New York won’t allow drilling, they should be embargoed from importing fossil fuels. Seems many share your longing for spite-based economic policies. I am sure it would go splendidly and end well. I’ll wager that it would end with drilling in CA and NY. There is a way to increase California oil production AND make it less carbon-intensive. It’s called #solarEOR and very simply substitutes zero-carbon solar steam for use in EOR (enhanced ouil recovery) instead of the usual steam being produced burning huge amounts of natural gas. 17% of all the gas burned in California to be exact. Best of all? Solar steam is actually cheaper than burning gas, even before any climate regulation like cap-n-trade or Low Carbon Fuel Standard. So oil companies can actually make money reducing their emissions, and cleaning up the local air quality in places like the SJV. And for climate impact? Fully implementing solar EOR would equal taking 3 million cars off the road. Considering the relative energy density of nat gas and solar power, it seems likely that to replace a gigantic amount of nat gas with solar, would take a gigantic amount of solar. Which, by the way, is intermittent. So would oil production shutting down at night be cheaper? Would cloudy days interfering with production be cheaper? Is it even possible to install massive solar collectors where they need the steam? How much is the land? They cannot make it economically viable even out in the frickin useless desert, where presumably land costs are minimal. We are talking about displacing one form of energy (natural gas burned to make steam) with another form (solar thermal to make steam) which produces no emissions. Both are equally large in energy content, but one is clean and cheaper. Some solar thermal systems have thermal storage and can run 24/7, and cost-competitively. So the intermittancy issue has been solved, and it does not require expensive batteries like storing electricity. Storing heat is quite cheap and simple. Obviously there will be days without sun. That’s why solar EOR is almost always focused on substituting steam at existing gas-fired steam facilities. So the existing equipment can always run if needed at night and on days with insufficient sun. Again, a simple drop-in hybrid solution. Certain fields, especially in California, have a lot of equipment and flat free space is at a premium. So solar EOR won’t work everywhere. But the land requirements are reasonable and available in many/most fields. Not sure if you’re aware of the economics of solar EOR, but good equipment is absolutely competitive with natural gas and produces no emissions. It can produce solar steam for EOR in California at $2.50/mmbtu gas equivalent price on site, today, unsubsidized. Which is fully competitive. Factor in the 30% solar ITC, and the LCFS credits it earns, plus possible cap-n-trade and local air permits, and the “fuel” price can even go below zero. Yes, below zero. So until / if society weans itself off oil 100%, this is a pretty good deal: save money, cut emissions, clean up the local air quality, create new local solar jobs and economic activity, still keep all the oil jobs and economic activity, and still provide cost-competitive fuel that society requires for a few more decades but with a lower carbon footprint. “cheap-energy-forever” – Don’t worry they’re still drilling in Texas. “The collapse of the oil industry in California, once our second-most-important producing state, is a very sad thing to see.” You’d might think so. Even this Coloradan has had an engineering friend working the Bakersfield area not many years ago. But in truth, I WANT Northern Mexico to secede – the sooner the better! As i understand it, when they shut down some wells, those wells can never be brought back into production again. (something about the geology and seepage I believe) They are not just not pumping oil, they are cutting off the supply to future generations. When a well is permanently abandoned, in accordance with state law or federal offshore regulations, steel equipment (pipe, mostly) is pulled from the hole which is then filled with cement. You have to drill a new hole. Just send $$$. In addition, successfully drilling a previously produced (reduced fluid pressure) oil or gas reservoir can be problematic. I want to know why the majority of Californians are so gullible when it comes to the environment?